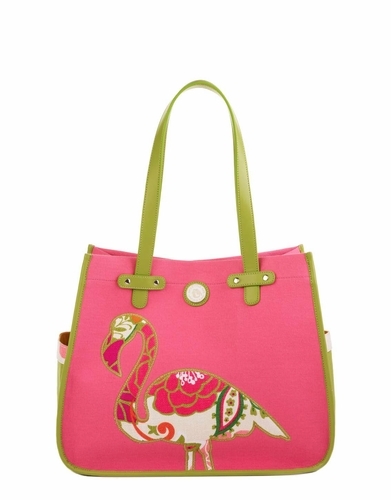 As durable as it is attractive, this canvas bag features expertly appliqued Spartina icons in colorful patterns! Perfect for toting flip flops, water bottles, sunblock and your favorite summer reads, this bag includes two deep exterior side pockets perfect for your mobile and music devices, while interior pockets keep your items secure on the inside. Features fabulous faux leather details and is available in three patterns. Now a cozy and beloved bakery and cafe, The Cottage on eclectic Calhoun Street has been welcoming people home since distinguished soldier J.J. Carson built it in 1868. So warm and welcoming was the cottage that its front room became the inaugural home of Bluffton's First Baptist Church in 1902. Today, the front porch invites colorful locals and visitors alike to sit for a spell amidst garden flowers to enjoy a cup of afternoon tea. Inspired by The Cottage's charming Southern porch, Spartina designed a gracious and vibrant floral pattern that is as welcoming and comforting as a freshly made scone. Stop on by and say "hello" to Leslie, then wander next door to the Spartina Flagship store.